The large community area set in the heart of the building is a masterstroke that some academic departments might wish to emulate! 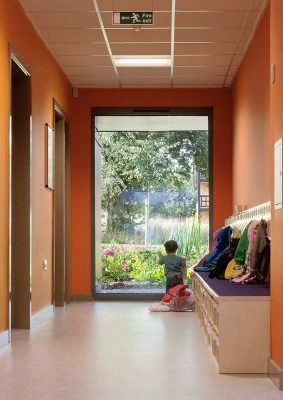 The building houses a nursery for 80 children and a café. Thanks to its location, established in the Development Plan (also by MJP), the building plays a vital role as a social focus for university staff and students, and serves the wider community of Warwickshire. Located within the Green Belt, it is designed to make the most of the surrounding green areas, being perceived as a light pavilion in the open land. 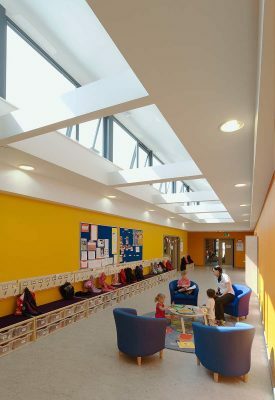 The design allows part of the café to be used by the nursery for extra activities, such as an After School Club and Children’s Centre. Outside nursery opening hours, the café can be used independently for student parties. 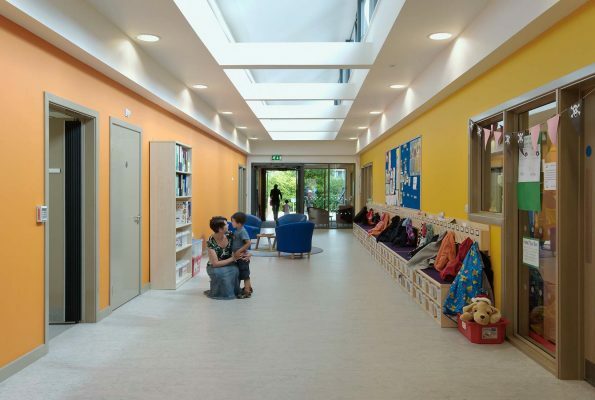 The internal arrangement allows for flexibility of use and can accommodate future change in function, while maintaining the high security standards required for children. 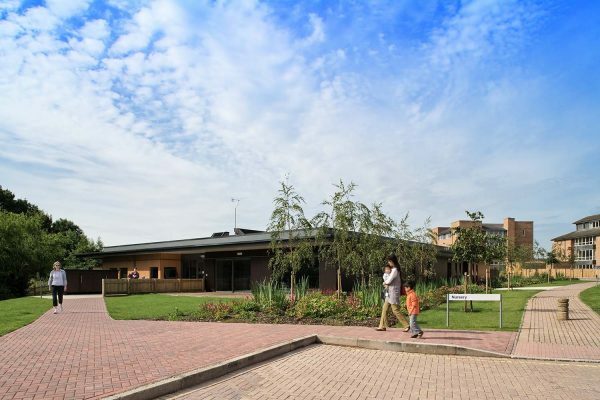 The single storey building consists of three volumes which are clearly expressed in the plan: two contain the nursery ‘home bases’ for babies and older children; the third contains the café and ancillary facilities. 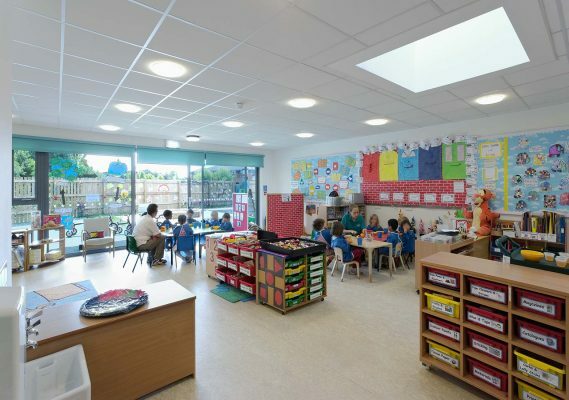 In the centre a top-lit ‘street’ provides a focus for the nursery. The three elements of the building are expressed both internally and externally by the use of different colours. …The big, beautiful spaces feel as if they are in the open air; while the open air spaces connect with the indoor spaces through the clever use of windows, doors and decking. 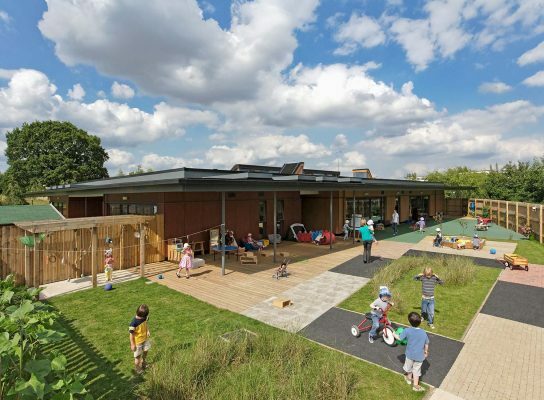 A generous flat roof overhangs the building providing shelter to outside terraces and play areas from the weather. The roof has been designed to allow a retrofitted green roof, to increase sustainability and minimise the visual impact. Due to the fast track programme, the building was designed to allow for the use of a pre-fabricated system. Britspace – the steel framed system manufacturer, delivered to site internally fitted out pods that were then connected together, made weatherproof and finished externally.